If sun-drenched white sand and crystal waters are just what you’ve been dreaming about, it might be time to take a trip to Kerikeri, the golden horseshoe bay in New Zealand’s north. If you’re planning to drive up from Auckland and you missed our travel guide from Auckland to the Bay of Islands, check it out before continuing on to Kerikeri below. There are two main ways to get to Kerikeri. If you’d prefer to arrive directly, simply follow State Highway 1 from Kawakawa to Pakaraka. Here, Highway 1 will become State Highway 10 which you can follow directly to Kerikeri. However, if you would prefer to take in some other sites on your way, consider taking your journey through Paihia. Here you can follow our guide from Kawakawa to Paihia which includes the onward journey to Kerikeri while taking you via the incredible Naruru Falls and the Waitangi Treaty Grounds. 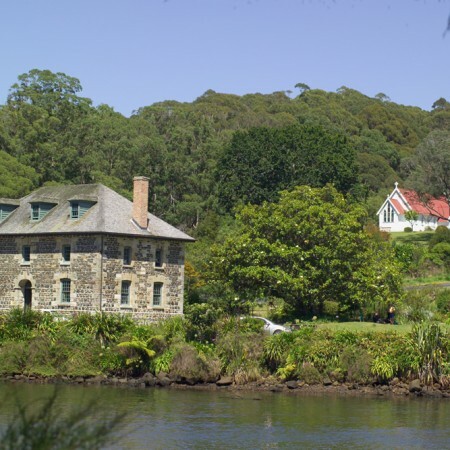 Kerikeri is New Zealand’s earliest European settlement, and is often described as the Cradle of the Nation. Easy access to Rainbow Falls and walking tracks to/from Waitangi mean natural wonder and history collide within close distance. Kerikeri is also known for its beautiful swimming beaches and water activities. Nearby Aroha Island is a 5-hectare island that offers refuge to the North-Island brown kiwi and many other native birds. It is reached by a walkway and makes for a lovely spot for an afternoon picnic. If you’re keen to drive northward, Cape Reinga at the northernmost tip of New Zealand where the Tasman Sea and Pacific Ocean collide. Whether Kerikeri is simply a stopover on your way through the Bay of Islands or your final destination, there is no doubt you’ll soon be making plans to return. You can click on the little star next to where it says Kerikeri at the top of the map. This will save it to your Google Map (You will need a Google Account for this). Scroll across and click on the Maps tab and you should see Kerikeri there. Now when you are in the Menu you should see Kerikieri just above the Traffic option now. Please note this map has listed both the way to Kerikeri directly as well as Kerikeri via Paihia. You can use the slide next to Kerikeri to show you the map legend where you will be able to choose which way you want to take.